This useful and inexpensive keyboard pull-out tray requires no special hardware. It is very simple to build and can easily be completed in a few hours. 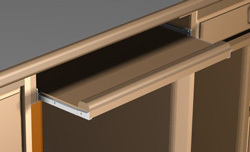 The keyboard tray in this plan will accommodate a keyboard with a maximum size of 16" by 21". For larger keyboards, you may easily adjust the measurements accordingly.